It was on this day in 1929 that the mob war between Al Capone and Bugs Moran came to a violent head inside the garage of the SMC Cartage Company in Chicago. 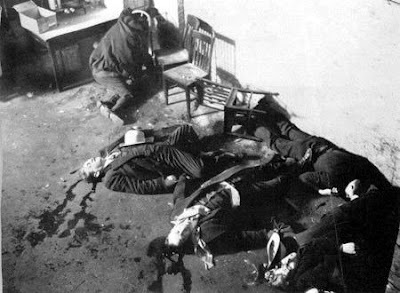 Seven members of Moran's gang were ambushed in a well-executed plan by Capone's enforcers (some dressed as Chicago policemen) and butchered mercilessly by machine gun fire. Moran himself by some twist of luck managed to avoid being at the scene. Read more about the Saint Valentine's Day Massacre here.